Vellum is Houdini’s fast cloth (and other PBD) solver. You can associate cloth with agent shapes and then simulate the cloth as part of the overall dynamics simulation along with the crowd and any other dynamics such as rigid bodies. Because you can set up Vellum cloth in geometry using SOPs, it’s ideal for inclusion in an agent shape. See the SimpleCrowdCloth node example for a fully worked example attaching capes to agents and simulating them. In the SOP network where you set up your agent definition(s), you will add vellum cloth on top of the imported agent geometry, and then use that as the agent shape geometry. Alongside the agent definition SOPs, create a new SOP chain that creates the cloth geometry. You can import the cloth geometry or define it here. In the cape example, the cloth is a simple grid. Append a Vellum Constraints node to the cloth geometry. Set the Constraint type to "Cloth". This sets up attributes on the geometry for the Vellum solver to treat it as cloth. Connect the agent shape’s rest geometry to the Vellum Constraints node’s third input. Append another Vellum Constraints node and set the Constraint type to "Attach to Geometry". Instead of attaching specific points, you can simply specify a group on the cloth geometry and turn on Constrain to closest point. Append a Vellum Pack node to pack up the cloth geometry. Append a Null at the end of the chain, and give it a recongnizable name (for example, CAPE1_OUTPUT). We will use this node when we import the cape into an agent shape. You can add a Vellum Solver SOP at the end of the vellum setup chain to do a quick sim of the cloth, for example to check how it hangs on the character. This is faster than running the full crowd + cloth simulation. In the SOP chain where you define the agent, above the AGENT_DEFINITION Null, add an Agent Layer node. A layer creates a way of varying a character. Set the Layer name to a name describing this skin variant, for example skin_with_short_cape. Set the Transform name to the named transform the new shape should be relative to (this is usually the character skin). In the SOP path field, enter the path to the cloth geometry for this variant. In the Shape name field, enter a descriptive name for this shape (the cloth), such as short_cape. Repeat for each cloth shape layer you want to add to the agent definition. When you populate the crowd, remember to seed the crowd with the variants you've created. 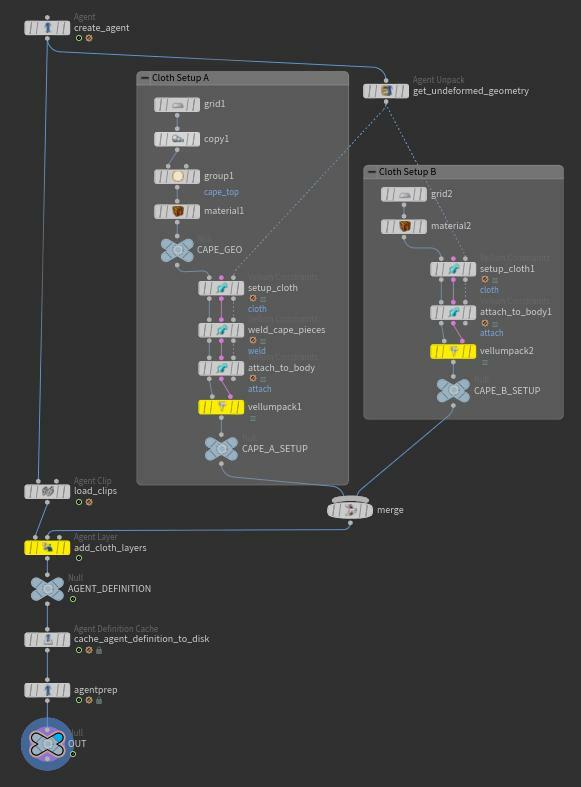 In a SOP network, grab the output of the Crowd Solver DOP. For example, you can use a DOP Import SOP, point it to the Crowd Object inside the DOP network, and set Import style to "Fetch Geometry from DOP Network". Append an Agent Vellum Unpack node to extract the vellum geometry. Append a Vellum Solver SOP to simulate the vellum geometry. The output of the Vellum Solver SOP is only the simulated cloth geometry. You need to take that geometry and merge it with the crowd output somehow (for example, merge the geometry, or render them seperately and composite them together).